Thanksgiving is my very favorite holiday. I hear that some people have odd Thanksgiving customs like ‘watching football’ or ‘shopping’, but for us it’s pretty much an entire holiday about cooking and eating. These are two of my favorite things, so I’m happy. This week I’ve started poking around recipe sites looking for menu-planning inspiration. Although we have a couple of traditional must-have dishes (cornbread dressing and pumpkin pie), I like to experiment too much to make the same meal every year. Along the way I ran across a ‘Thanksgiving on a Budget’ article at Epicurious that I thought was worth sharing. It suggests a menu (soup, turkey, stuffing, vegetable, bread, dessert) that serves eight for $80, and also lists six very good general money-saving tips. It also gave me the idea to document our Thanksgiving dinner this year, including tracking the recipes and actual cost. I have a monthly grocery budget and my usual frugal practices have kept us running well under it, so I wouldn’t ordinarily break out the cost of Thanksgiving particularly. But it might be an interesting experiment — too late to be of use to anyone else this November, of course, but maybe helpful for Christmas dinner or next year. I shall challenge myself to see how lavishly gourmet I can get … on the cheap. 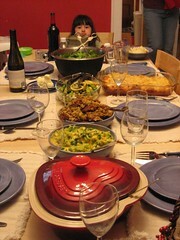 We’ve recently been talking about the ridiculous amounts of money our family spends on one dinner and a few leftovers. I’m liking this plan, and I’m going to check out that link.